Single on Valentine’s Day? Go you! Or poor you! Or who cares? Well, it’s almost Valentine’s Day, and you know what that means; advertisements, magazine articles, and morning show special guests to make sure you feel pressure to have the “perfect” Valentine’s Day with your sweetheart. But wait! What if you don’t have a significant other?? Well, there’s media out there for you too; you’re either faaaaabulously single, or you should buck up, being single isn’t that bad! Or you’re sitting alone in sweatpants, eating ice cream from the pint, watching Bridget Jones’ Diary for the umpteenth time. When I was in high school, I was pretty anti-Valentine’s day – although there was that year that I got the MOST carnations in my homeroom – you go Glen Coco! I’d wear black, roll my eyes at the girls proudly carrying around teddy bears because they were “too big” to fit in their lockers (don’t give me that crap – teddy bears are VERY smushable), and be bitter all day. After a couple of those, though, I started to think about it. I realized that I wasn’t ACTUALLY angry, bitter, or sad that I was single on Valentine’s Day. I just felt like I SHOULD be. See, things like magazine articles and advertising can make you feel like whether you have a boyfriend (and yes, I mean boyfriend – hello, heteronormativity!) or not is the most important, defining thing about you. And it’s really easy to internalize that message. How many girls do you know who have good grades, athletic accomplishments, caring friends, a loving family, and the respect of their teachers and peers, but who still feel like they’re missing something because they don’t have a boyfriend? And I’m not belittling having a boyfriend or girlfriend – finding someone who makes you feel good about yourself, who you trust, and who you can make out with is a really great thing. But I worry that a lot of times, girls feel like all of the other stuff doesn’t matter if they’re “still” single. And that feeling triples on Valentine’s Day. Of course, there are also plenty of magazine articles and advice columns for people who are single on Valentine’s Day. But their reassuring, slightly condescending tone gets my hackles up, as does the fact that, by telling us how great it can be to be single on Valentine’s Day, they’re pretty much reinforcing the ways that culture says it’s not. It’s like if I walked up to you in the middle of school and said, “Don’t worry sweetie, your haircut looks GREAT”. What does that imply? Articles on how to “survive Valentine’s Day” sometimes just make you more aware of the fact that you should feel like Valentine’s Day is something to “survive” (I realize that is an awkward sentence, but do you get what I mean?). Articles on “How to be happy being single on Valentine’s Day” imply that finding happiness while single is so difficult that you need a “how-to” article on it! As if you, in all of your awesome glory, with all of your friends, family, and accomplishments, are not enough. Single girls are not fabulous, glamorous Carrie Bradshaws, with introspective voice-overs as we look for love and the perfect shoes. We’re not sad Bridget Joneses obsessing over our weight and whether or not he called. We’re not angry, bitter spinsters, confrontational man-hating feminists, or sassy chicks. In fact, there is NO one trait that defines all single women. People are actually all different and individual (I know – mind-blowing stuff, huh?). So if you are single on Valentine’s Day, and the social pressures ARE making you feel bad about it, feel free to take the advice of the magazine articles on how to feel better and reclaim the day for yourself. But keep in mind, there is no “right” way to be single, on Valentine’s Day or any other day, and however you choose to observe or ignore the holiday is totally up to you. It’s a holiday that was blown out of proportion when people realized they could use it to sell stuff. I love Galentine’s Day – a day where it doesn’t matter whether you’re single, coupled, straight, gay, or some lovely mess of all of those options with a few extra thrown in for good measure; what matters is that you have awesome friends and that you take the time to appreciate each other in all of your awesome glory. I tried to find some resources about Valentine’s Day in high school when you’re gay, and was only able to find this one. If anyone has links to blogs or articles that deal with that topic, please share them! 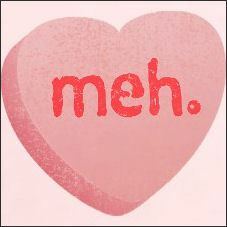 I know that I didn’t address the pressure that Valentine’s Day puts on people who ARE coupled – I may do that next week. And I know that I didn’t address guys on Valentine’s Day – for instance, the cultural perception seems to be that guys either feel tons of pressure to craft the perfect, romantic Valentine’s Day for their girlfriends (again, heteronormativity), or are relieved when they don’t have to do anything for Valentine’s Day. So again, if you want to share links on that topic, I’d appreciate it! ← A post about blogging – so meta! Me and my friends celebrate Galentines every year 🙂 Go Leslie Knope! I’ll be celebrating it with the little girl I nanny for – she’s a pretty awesome gal!